White Texas sheet cake will become a favorite recipe. This recipe for White Texas Sheet Cake is easy and delicious. If you like the regular Texas Sheet Cake, this one is a white version. They are both good! In a large bowl whisk together the flour, salt, baking powder, baking soda and sugar. Bring water and butter to a boil on the top of the stove, remove and pour into flour mixture. Stir in sour cream, almond extract, buttermilk and eggs in that order with a spoon. Spray or line a 10 x 15 jelly roll pan (this is a regular baking sheet with a lip all the way round it). I usually just line mine with aluminum foil. Bake cake in a preheated 375 degree oven for 20 to 25 minutes. Let cool and frost with recipe below. Cut cake into squares. Makes about 15 to 20 servings depending on size you cut your pieces. Enjoy! Note: I store this cake in the refrigerator. 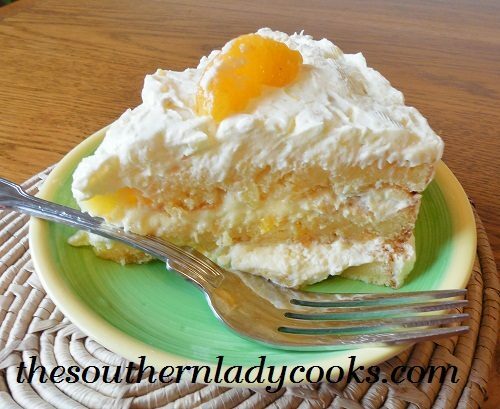 This White Texas Sheet Cake is wonderful for any occasion and has great reviews! In a large bowl whisk together the flour, salt, baking powder, baking soda and sugar. Bring water and butter to a boil on the top of the stove, remove and pour into flour mixture. Stir in sour cream, almond extract, buttermilk and eggs in that order with a spoon. Spray or line a 10 x 15 jelly roll pan (this is a regular baking sheet with a lip all the way round it). I usually just line mine with aluminum foil. Bake cake in a preheated 375 degree oven for 20 to 25 minutes. Let cool and frost with recipe below. Cut cake into squares. Makes about 15 to 20 servings depending on size you cut your pieces. I cantell you are an amazing cook! Thank you so much Nancy. I try! lol. Happy to have you in our community and have a great week. I have made this several times and it is so easy and so delicious, sure doesn’t last long here. Tell me, please, do you grease/flour the aluminum foil? What about using parchment paper? …thank you! Hi Lynda, I never grease and flour a baking pan or sheet anymore. I use cooking spray instead. It is much easier and works well. I did not even spray the foil for this cake but you can if you want. I have not tried it with parchment paper but see no reason why you couldn’t use it.